Overloaded communication channels lead to a torrent of messages users can't keep up with. Slack is a powerful communication tool and one of the most celebrated tech companies of the past couple of years with 2.7 million daily users and a $3.8 billion valuation. So it has been interesting to witness the so-called "Slacklash" -- a small but rising tide of exhausted users vowing not to use the service again. Where once the messaging platform was called "the thing that keeps us all together", there is now a website chronicling the backlash, The Atlantic has reported about the growing number of complaints and, of course, there is a hashtag to capture #Slacklash tweets. Why is a tool with so much promise and enthusiasm being turned on so quickly by an increasing segment of its early adopters? 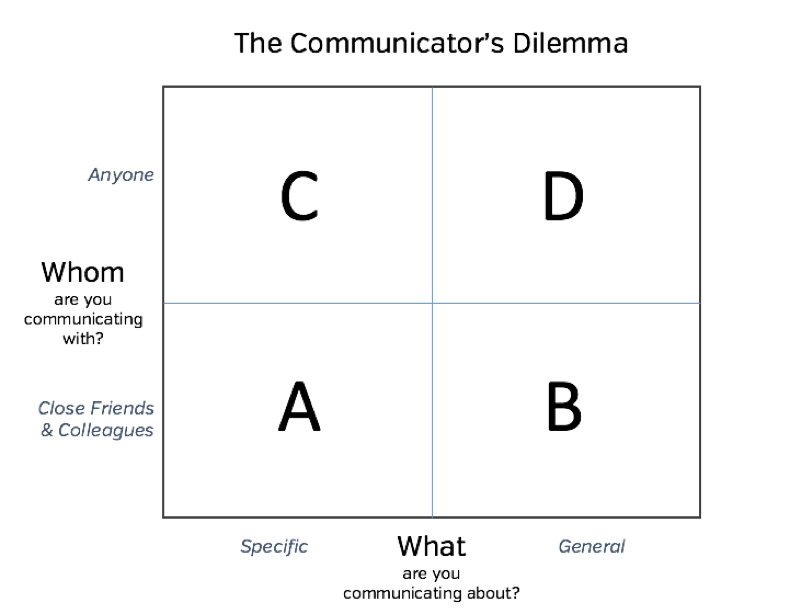 Sure, it may just be 7:00 Silicon Valley Time but a major reason in my estimation is the inevitable ineffectiveness of communication platforms -- what I call The Communicator's Dilemma. All new communication platforms start in quadrant A. Life is great in A. You feel so efficient. You're communicating with people you know on topics you care about, with few distractions. Time-wasting tools, like email, that occupy quadrant D seem like relics of the less-productive past. "I'm getting so much done," you declare, "I'll never use email again!" But it's very difficult to stay in quadrant A. Users inevitably expand the spectrum of the efficient new medium to more friends and colleagues, while discussing broader topics. The platform vendor will obviously encourage this expanded usage and engagement as part of its growth strategy. But as soon as this happens, the utility of the platform tips from communication to distraction. The Communicator's Dilemma strikes again. Slack is the latest shiny new platform to go through that maturation, but hardly the only one. Facebook is a great way to stay in touch with friends, but it also inundates you with distant relatives cluttering your feed with their crazy cats. LinkedIn started as a powerful way to build your professional network, but is increasingly a platform for sales pitches and "inspirational quotes" -- the workplace equivalent of cat photos. In all these cases, the tool is not necessarily the problem. As a messaging service, Slack is excellent with great features like channels that, in theory, should make people more productive. But because Slack can be used to communicate about anything, it's hard for users to intuitively grasp how to employ it most effectively. As a result, channels become overloaded leading to a torrent of notifications and messages that users can't keep up with. Slack was supposed to be a more productive alternative to our overloaded inboxes, yet is starting to provoke similar levels of resentment among users as email. Ultimately it comes back to the Communicator's Dilemma. Any replacement for email that aspires to occupy Quadrant D will inevitably assume many of the problems associated with email. It may not be fashionable to say it, but email remains a useful tool. Most of us want and need a horizontal communication tool where anyone can contact us about any subject, we just don't need too many of them dividing our attention. The solution to The Communicator's Dilemma is not to add more horizontal platforms like email or Slack but instead to supplement them with vertical services that have a clearly defined purpose, like how engineers discuss software development in Github. Function-specific tools allow people to actively choose to go in and get work done then get out when they're finished. They avoid the inefficient context switching of an inbox full of messages, while easing the burden on Quadrant D tools by having task-specific conversations in a more effective place.